Heard on news in Vancouver.A large box store is banning the sale of incandescent light bulbs. For those that are EHS I advise to stock up as I have done before you are not able to buy them any where. This might be the way government intends to force fluorescent bulbs as the phone companies are forcing us to use cell phones by removing public pay phones. GRANT COUNTY, WISCONSIN -- A dairy farming family says underground currents from old power lines killed hundreds of their cows and sank milk production. Tuesday, a Grant County, Wisconsin jury agreed, awarding the Bollant family $5 million in damages to be paid out by Scenic Rivers Energy Cooperative. A few years ago when the costly trouble was seemingly unending, Steve Bollant says he and his brother Tommy were ready to give up the family dairy business. "I was done. I was not doing it anymore. I just couldn't take it anymore," Steve Bollant said. "It was just a plain nightmare is what it was." The Bollant family started farming more than a century ago, going into dairy in 1956. Bollant notes the family has been recognized for top-notch farming, even winning awards for milk quality from the company they sell to. That's why he says he was bewildered when big problems started in 2002 when they moved cows into a new barn. "It was just unbelievable. We lost hundreds of cows. Hundreds of cows, and milk. We'd dump milk down the drain for bad milk, and the veterinarian bills were anywhere from 12,000 to 17,000 some months," Bollant said. The barn was built near decades-old Scenic Rivers Co-op power lines. Christopher Strombaugh, one of the Bollant family's attorneys, says the lines dated back to the 1930s and the New Deal program to bring power to rural areas (the Rural Electrification Act). The Bollants had heard of electricity causing problems for farmers. They hired experts who found stray voltage was going into the ground, instead of completing a circuit. They also called the co-op. "We had Scenic Rivers come out and test. They said we didn't have a problem, but then our guys say, putting it in the ground, 96% going in the ground, and was coming right through our barn." Eventually, the co-op did replace the lines, but a couple years after that, Strombaugh says the co-op incorrectly installed a meter on one of the poles near the barn, again sending electricity through the ground. The Bollants say the animals were getting hurt, dying, and weren't able to produce milk. They also say they and other workers were in pain as well (though Strombaugh says the jury wasn't able to hear any testimony about it). In 2008, the meter problem was fixed and the stray currents stopped going through the barn. Bollant says since then, his more than 500 cows are healthy and have nearly doubled their daily milk production. The farm is now producing more than a semi load of milk each day. "Just night and day's difference. You just can't believe it." The Bollants say they didn't want to take the issue to court and were hesitant to file a lawsuit. But Steve Bollant said the money lost was getting to be too much, and that this problem happens at other farms, so he wanted to stand up for all of them. "This is our family life, our family farm, and we lost all these cows and you know, somebody, we had to stand up for it," Bollant said. Strombaugh calls this verdict "a drop in the bucket" because there is no program to replace the old power lines running through rural areas. He says other farmers undoubtedly face the same problems with various energy companies. Co-op officials say they respect the jury's decision, but they maintain their employees did the tests they were trained to do by the USDA and State Public Service Commission.. The co-op says it is considering an appeal. Note - Stray voltage / ground current is a significant problem in North America which causes illness and death to animals and humans. The following is a quick summary of another fifteen papers that have come out over the last few months related to effects of electromagnetic radiation. TORONTO, Ont. - Friday is the first national "No Phone Zone" day. It is a day to honour those who have been killed by distracted driving and to encourage people not to talk or text while behind the wheel. It's part of Oprah Winfrey's "No Phone Zone" campaign, which police have embraced even here in Toronto. Sgt. Tim Burrows, with Toronto Traffic Services, said there have been too many cases where drivers have been involved in serious crashes while on their cells. "[...] There are people dying on our roadways, people are injured with lifetime disabilities because of the fact that people are distracted by the use of a cellphone within a car," he told 680News. He said he would like to see more Torontonians join the movement. "Try it for one day. [If] you don't have a cellphone in the car with you, you're not tempted to text, type or talk. Just put it away. We know it's against the law in Ontario - but let's do one more step and take the initiative to sign the pledge to make your car a "No Phone Zone." Burrows added that since February 1 Toronto police have charged over 3,000 motorists for using their phones. If you would like to join the more than 200,000 others worldwide who have signed Oprah's "No Phone Zone" pledge, click here. Oprah will dedicate Friday's episode to the "No Phone Zone" campaign. The Standing Committee on Health met by videoconference at 9:03 a.m. this day, in Room 853, 131 Queen St., the Chair, Joy Smith, presiding. Members of the Committee present: Hon. Carolyn Bennett, Colin Carrie, Patricia Davidson, Luc Malo, Cathy McLeod, Joyce Murray, Joy Smith and Tim Uppal. Acting Members present: Serge Cardin for Nicolas Dufour, Dean Del Mastro for Patricia Davidson, Royal Galipeau for Patrick Brown, Carol Hughes for Judy Wasylycia-Leis and Hon. Anita Neville for Kirsty Duncan. In attendance: Library of Parliament: Marie Chia, Analyst; Karin Phillips, Analyst. Witnesses: Department of Industry: Marc Dupuis, Director General, Engineering, Planning and Standards Branch, Spectrum, Information Technologies and Telecommunications Sector; Peter Hill, Director, Spectrum Management Operations, Spectrum, Information Technologies and Telecommunications Sector. Next-Up Organisation: Annie Sasco, Director, Epidemiology for cancer prevention, Institut national de la santé et de la recherche médicale. University of Ottawa: Riadh Habash, Doctor, School of Information Technology and Engineering (SITE). As individuals: Anthony Martin Muc, Assistant Professor, Dalla Lana School of Public Health, Occupational and Environmental Health Unit, University of Toronto; Olle Johansson, Associate Professor, Experimental Dermatology Unit, Department of Neuroscience, Karolinska Institute; Andrew Goldsworthy, Doctor, Lecturer in Biology, Imperial College London; Dimitris Panagopoulos, Doctor, Department of Cell Biology and Biophysics, Faculty of Biology, University of Athens. Pursuant to Standing Order 108(2) and the motion adopted by the Committee on Tuesday, March 30, 2010, the Committee resumed its study on the Impact of Microwaves on Human Health. Anthony Martin Muc, Annie Sasco, Riadh Habash, Marc Dupuis, Dimistris Panagopoulos by videoconference from Athens, Greece, Olle Johansson by videoconference from Stockhom Sweden and Andrew Goldsworthy by teleconference from London, England made statements and, with the other witness, answered questions. At 10:46 a.m., the sitting was suspended. At 10:47 a.m., the sitting resumed in camera. It was agreed, — That the proposed operational budget in the amount of $ 12,000, for the Committee's study on the Impact of Microwaves on Human Health be adopted. It was agreed, — That on Tuesday May 11, 2010, the Committee meeting be devoted to the study on Health Human Resources. At 11:04 a.m., the Committee adjourned to the call of the Chair. As a non-specialist, the best way I have found to stay updated, along with reading CHE-EMF postings, is to visit Louis Slesin's brilliant website Microwave News. First and most important, the issue of cell phones and health is no longer ignored by mainstream US media. That is an important breakthrough (a) in itself, (b) because it gives consumers the capacity to make safer choices based on their own risk appraisals, and (c) because in the long run it may lead to better research, better policies, and market shifts as manufacturers respond to consumer concerns and market opportunities. There is growing interest in EMF the academic and non-profit communities. When CHE-EMF started, a very small number of academics, NGOs and advocates were actively engaged with EMF. The number of key players has significantly increased in the NGO and academic community. While differences in perspective naturally exist among the key players, the cumulative net effect of more powerful key advocates is very beneficial for the field. As the media, academic, and non-profit constituencies concerned with EMF dangers increase their visibility and reach, these developments force industry, regulatory, and mainstream health constituencies that claim there is no health risk to up their game as well. Blanket denials of risk no longer suffice. The debate tends to become more granular as mainstream media, sensing a major story, does a better job of pressing both advocates and defenders of EMF to explain their positions. A more granular debate necessarily increases attention to the science. Increased attention to the science necessarily leads to better understanding of the structure of industry support for science and its implications. Likewise, loose and scientifically irresponsible positions by those concerned with EMF dangers become more vulnerable. The granularity of the debate, over time, favors more scientifically grounded arguments on both sides. The well known "sieve" model of such debates usually characterizes the outcome, in which initially widely disparate positions are forced, as the debate becomes more granular, into a narrower "sieve" that generates a broader consensus on science and policy outcomes. That does not mean the outcome will be "right" from any single perspective. But it describes what may be likely to happen. The fact that The BioInitiative played a key role in alerting European governments to EMF risks — in a culture more disposed to see those risks in the first place — created a beneficial international comparison, much as European REACH legislation did in the chemical arena. The BioInitiative gathered some of the best science in the world on EMF issues (in my humble opinion as a lay person) and seized the scientific high ground in a way that European governments seized on to issue precautionary warnings on cell phones and health. Cindy Sage and Nancy Evans of The BioIntiative (also co-coordinator of CHE-EMF), Ken Cook and his colleagues at Environmental Working Group, Devra Lee Davis, Ronald Herberman (Director Emeritus of the University of Pittburgh Cancer Institute) and David Servan Schreiber in France are among those making major contributions to the evolution of the EMF debate. Many more contributors could be cited. All of this means, in my view, that the EMF debate has shifted both quantitatively (more debate) and qualitatively (gradually improved debate) as media, academics, nonprofits and independent advocates amplify their critiques of health risks, and industry, government and mainstream health groups begin to respond. Over the next five years, we can anticipate that some of the mainstream health groups will begin to move away from unqualified support of industry (there are early signs of this movement already). The mainstream health groups have relatively little vested interest in supporting industry, other than their generally conservative views on the role of the environment in health. Industry may seek to invest in support for health groups as a way of delaying the trend, but over time, assuming the science continues to go in the direction it is headed, toward substantiating a wise array of health risks, the health groups will have little choice but to recognize the concerns. As media, advocacy, and health concerns are better established, look for key industry segments to break away to market to those with health concerns. Look for key media personalities to establish EMF as a major concern. Look for key political figures to seize on EMF (some already have) and make it an ongoing part of their profile. Look for key labor groups including fire fighters, policy, military veterans, and others exposed to intense EMF environments to voice increasing concerns with their risks. Above all, look for a widening awareness across the US and around the world of EMF health concerns driven by people who (rightly or wrongly) attribute some of their health concerns to EMF exposures. This combination of media, advocacy, science, health, labor, political and widespread public concern makes it highly likely that EMF concerns — which have now achieved lift-off in the major media, will continue on a sharpening upward trajectory over the next decade. Unfortunately, there has been very little philanthropic or governmental support for independent scientific research and responsible policy advocacy to date. But as these other trends sharpen, philanthropic support for science, policy and advocacy may grow. At the same time, the installed industrial EMF base will continue to grow and the cost of shifting to less harmful technologies will continue to grow. Moreover, other environmental and non-environmental threats — climate, chemical, biotechnology, nanotechnology, infectious diseases, nuclear developments, economic developments, and the like — may relativize perception of the size of the risk. Industry will do all it can to cede scientific ground as slowly as possible. So even if there is an epidemic of brain cancers (for example), industry will switch to recommending ear buds or other ameliorative approaches. And if the background noise of other threats is loud enough, those concerned with health effects of EMF may ultimately win the scientific battle but lose the exposure war. Israel is a perfect example: many scientists and Israelis with scientific understanding have strong concerns about EMF exposures, but competing security concerns relativize perceptions of the EMF risk and reduce demand for action. A key question is whether the full scope of EMF health effects on a systemic level is recognized earlier or later in the evolution of the debate. Generally, it appears that systemic effects will be well demonstrated in lab and animal research, but the strong innate scientific conservatism that opposes generalization from these data to humans may block or marginalize societal and scientific awareness of systemic concerns. A second factor that makes recognition of systemic effects so difficult is that these effects interact with chemical contaminants and many other factors. EMF sensitivity, like chemical sensitivity (and in fact the two overlap) is a lead factor in awareness of human systemic effects, but is likely to suffer the same fate of marginalization that chemical sensitivity has suffered for decades. James McNeil of the Brundtland Commission once told me there were 4 possible futures: business as usual, descent into chaos, achieving sustainability, or becoming artificial people on an artificial planet. The truth is the real future is not one of these four but a constant negotiation for market share among all four futures. To some degree, business as usual continues. To some degree we descend into chaos. To some degree we move toward sustainability. And unquestionably we are becoming artificial people on an artificial planet. Those of us concerned with the environment and health are doing all we can to move the sustainability index upward. EMF is one of a dozen major areas in which we are making that effort. In summary, these hypotheses suggest one possible future in which those of us concerned with the impact of EMF on health ultimately win the scientific debate. The scientific affirmation may come by 2015 (to pick a plausible date) as mainstream media interest increases, media stars make this their issue, industry players market to those with health concerns, key politicians join the fray (like Arlen Specter), labor expresses concerns, mainstream health groups move away from blanket denials of health concerns, new scientific studies are released into a prepared and concerned media environment, and more and more people experience what they believe to be health effects, and Europe and other regions heighten their policy and consumer response to EMF concerns. At the same time industry will fight a delaying action to discredit, discount and deny the science for as long as possible as installed infrastructure and product streams are developed. Virtually all industries under attack take this approach. The purpose of these future scenario notes is not to ignite an advocacy debate on CHE-EMF (which is never our purpose). It is rather to frame an awareness of the context in which we continue to work to understand the emerging science on EMF and to sustain a dialogue of science and civility. I welcome comments that contribute to our deeper understanding of the present and future context of our science dialogue. The Wireless networks that are used with Smart Meters is the problem. California home owners have already experienced health effects according to citizens who stood up to a microphone at a three hour meeting in California. Radio Story on BRAG Antenna Ranking of Schools--picked up by NPR and several thousand stations nationally. Not a out of the box winner as we have gotten over close to a million airings before. We heard a major radio network does not believe this is an issue for schools and chose not to circulate it. Press the button on the Right to hear it. WASHINGTON, D.C. – There is new evidence it's not just cell phones that might harm children's health, but the invisible radiation from cell towers and antennas sited near schools across the country. A four-year study released today (Wednesday) ranks children's potential exposure to radiation at more than 6,000 schools in U.S. state capitols. Dr. Magda Havas, author of the "BRAG Antenna Ranking of Schools," says many cell antennas are located too close to schools. "In some states, for example, there's more than 100 antennas within a quarter-mile of the school. Now, that's very high levels of radiation." Many regulatory bodies take the position that radiation is harmless unless it is powerful enough to heat tissues, such as in a microwave oven. Havas, a professor of environmental and resources studies at Canada's Trent University, says her research indicates daily exposure to such radiation (called non-ionizing) increases the risk of developing cancerous tumors and other serious health problems. "Things like difficulty sleeping, chronic fatigue, chronic pain, headaches, and problems with cognition, both in terms of concentrating and in recall." The report recommends the Federal Communications Commission require wireless towers be kept at least 1,500 feet away from schools. In the past, citizen and community protests against siting antennas close to schools have been stymied by a provision of the Telecom Act of 1996 which limits state and local governments' ability to consider health or environmental concerns in the siting of wireless infrastructure. The report also allows parents to look up information about their children's school, if they live in a state capitol. Havas says few people are aware of the danger, and she believes it is vital to get the word out. "This is something that parents need to know about, teachers need to know about, and school administrators need to know about." Jim Turner, chairman of Citizens for Health in Washington, D.C., says previous studies have considered only short-term radiation exposure – while children in schools near antennas are being exposed all day long. "You start with a vulnerable immune system and you start dropping this daily for ten or 15 or 20 years, and you can end up with very serious problems in the long run." Havas' report is available online at www.magdahavas.com. Havas participates in a Congressional briefing today (Wednesday) at 1 p.m. EST, 2247 Rayburn House Office Bldg., Washington, D.C.
Will Marlatt and is wife Lee bought a condo in a quiet enclave near Leslie and Sheppard. They moved in last July, not long after the baby was born. We were talking at their kitchen table on a recent evening. The house is near a busy road, on the edge of a mall parking lot. There are railroad tracks nearby, but there are also plenty of trees. The overall impression is quiet and leafy green. Will said, "I came home one night. My neighbour asked what I thought about Bell." He must have responded with a blank look, because the neighbour asked if he'd seen the notice. It seems Bell Canada wanted to erect a 131-foot microwave tower on the edge of Will's back yard. Will didn't get any notice because he and his family had just moved in and they weren't yet on the property register. Or some such stupid reason. He led me outside, to show me where the tower was supposed to go. We walked along a grassy berm. "You see that fence?" It is chain link, and borders his back yard. "It's 38 feet from the back of my house. You see that tree? That's where they want to put the tower." A nice tree, by the way, with a fat branch that could hold a swing for a kid. No swings allowed on towers. Then Will turned and pointed to a bedroom window at the back of his house. "That's my son's room. He's one year old." You'd be ticked off, too — about the lack of notice, yes, but mostly about all those microwaves so close to your baby's room. Will is like you and me; he's a regular guy, and his concerns are our concerns: home and family first. The difference is, Will now knows a lot more about microwave radiation, and about community organizing, than he used to. He took up a petition. That's how he met Wilf McOstrich, a neighbour who happened to drop by as we were talking out back. Together, the men organized a neighbourhood coalition to fight off the microwave tower. Wilf, an artist, said, "We called a meeting in March. Bell came, and 70 people from the neighbourhood showed up. I think Bell was surprised. We had 200 signatures on the petition, and a lot of questions. But Bell supplied no information; it was a shambles." Will said, "The city has a protocol for these towers. The protocol discourages towers in neighbourhoods; it also discourages towers within 120 feet of a neighbourhood." He pointed to his fence. We went back inside. The two men showed me plans and letters and documents. As we were talking, Will's wife Lee came by with the baby, a sweet kid. Lee said, "He's a miracle baby. It was a high-risk pregnancy. I did everything I could to have a healthy baby. Nobody I know can put their hand on their heart and tell me microwaves are safe." Wilf pointed out that, if the tower was built where Bell wanted to put it, the value of their house would drop. And Lee said, "We can't afford to move, even if we wanted to. It's disheartening." Money is not her first concern. When I left, they were waiting for the results of a review of the situation by Industry Canada. But I had word from Will the other day. There will be no tower in the Marlatts' back yard. And yes, it takes a good strong undercurrent to cut down a microwave tower. $225 million gov't funds allocated to subsidize companies expanding high speed accessibility in Canada. In the beginning of the report it mentions concerns about health effects as being environmental effects, but later in the report mentions equipment disposal as the environmental effect. Does anyone know if electromagnetic fields might cause temporal lobe activity/seizures in susceptible people? For instance, could the electromagnetic field in a car, or near a computer, TV or in a hospital where a lot of equipment is in use cause a temporal lobe reaction? I've been reading lately about how scientists have been stimulating the temporal lobes with electrodes and magnets to cause hallucinations, dreams, out of body experiences, religious experiences, etc. and I was wondering if the EMFs in the everyday atmosphere might trigger seizures in people who for some reason are sensitive to them. I have had 2 abnormal EEGs, and been diagnosed with temporal lobe seizures. I've never seen a description of temporal lobe seizures that exactly fits what happens to me. I think I'm falling asleep, or I have dreams while I'm aware of what's going on around me. These aren't random; they almost always happen in a car, near a computer, TV, when I'm sleep deprived or very bored. My neuro said I'm not falling asleep, and he can't explain the dreams. All he said was that I have a seizure disorder and I have to accept it. Keppra has controlled most of this, but there are some times that it's not controlled. I can canoe in class III-IV rapids and never have a problem. I don't have episodes while walking down the street or hanging out with people or doing things around the house. But before medication, just put me in a car, near a computer, in front of a TV or sometimes on the phone and I'd slip into a lucid dream, drop off for a few seconds or lose time on a frequent basis. Fluorescent lights could make me feel like I was going blind or crazy by the end of the day. Does anyone else have this very predictable, non-convulsive type of TLE? I keep trying to make sense of this, and I can't. That's why I keep coming back with these questions--hoping someone else will say "oh yeah, that's exactly what happens to me!" Smart Meter Meeting - Dumb experts? At last night's PG&E Smart Meter forum, held in Sebastopol, Michael Herz, of PG&E and Leeka Kheifets, hired by PG&E staffed the table designated for radio frequency (RF) questions. Neither could answer basic RF technical questions about Smart Meters. When asked what the peak power signal strength (not time averaged) was at 8 inches from the meter, Herz said that unfortunately, they couldn't answer that question. They did not know the duty cycle, or how often the meters send or repeat RF signals. They could not answer what the RF exposure would be for a home with multiple meters. They didn't even know the make and model of the meters. I suspect that PG&E doesn't have any RF technical experts in their company. How can we trust a company to deploy such a massive RF installation-on every home-if they cannot answer basic RF public safety questions? HARTFORD – Last night, April 27th, legislation to have cell towers not be sited within 750 feet of a school unless the Siting Council finds that there are no economically feasible alternative sites within the municipality passed the House of Representatives according to State Reps. Livvy Floren (R-149), Lile Gibbons (R-150), Fred Camillo (R-151). "This cell tower language seeks to put added focus on the safety of children, students, and adults who work in schools first when siting cell towers in the vicinity of these venues," said Rep. Camillo, a member of the Environment Committee. Rep. Livvy Floren added, "This bill is a first step and takes into account local input regarding health and safety concerns about placing cell towers near schools." Rep. Lile Gibbons said, "Although not an outright ban of siting a cell tower within 750 feet of a school, the bill does require the Siting Council to acknowledge the proximity of a school as well as safety standards, neighborhood concerns and the latest transmission technologies in rendering its decision." The vote was unanimous in the House of Representatives 139-0. The bill now heads to the State Senate. WASHINGTON, D.C. - There is new evidence it's not just cell phones that might harm children's health, but the invisible radiation from cell towers and antennas sited near schools across the country. A new four-year study released Wednesday ranks children's potential exposure to radiation at more than 6,000 schools in U.S. state capitols. Dr. Magda Havas, author of the BRAGtm Antenna Ranking of Schools, says many cell antennas are located too close to schools. "In some states, for example, there's more than 100 antennas within a quarter-mile of the school. That's very high levels of radiation." Many regulatory bodies take the position that radiation is harmless unless it is powerful enough to heat tissues, such as in a microwave oven. Havas, a professor of environmental and resources studies at Canada's Trent University, says her research indicates daily exposure to such radiation, called non-ionizing, increases the risk of developing cancerous tumors and other serious health problems. The report also allows parents to look up information about their children's school, if they live in a state capitol. Havas says few people are aware of the danger. Jim Turner, chairman of Citizens for Health in Washington, D.C., says previous studies have considered only short-term radiation exposure - while children in schools near antennas are being exposed all day long. The report recommends the Federal Communications Commission require wireless towers be kept at least 1,500 feet away from schools. In the past, citizen and community protests against siting antennas close to schools have been stymied by a provision of the Telecom Act of 1996, which limits state and local governments' ability to consider health or environmental concerns in the siting of wireless infrastructure. This is a link to the microwave hearings that were held on Tuesday in Ottawa. The music at the intro has been removed, you can fast forward and rewind it - and you can download it to listen in an ipod. First, on behalf of the 100s of people in Victoria who were listening today to the meeting, I would like to thank you for having this gathering and for allowing an open discussion of these important topics -- microwaves and health. It hopefully will be first of many. When Ms. McLeod stated that she felt like going home to advise her constituents not to allow the tower, the response by Mr. Hill implied that that was your and your constituents' choice. But that is not true. Industry Canada has taken this power of choice away from us. We cannot protect ourselves because Industry Canada won't let us. Even when we know the radiation is dangerous because the transmitters are mere meters away from us, there is nothing we can do. According to Industry Canada policy (CPC 2-0-03) and practise, transmitters can be put anywhere, on anything, with no notification or consultation. Municipalities and residents are told only if a new tower is being erected, because Industry Canada believes people are concerned only with aesthetics, not health, as told to me by Mr. Jim Laursen and Mr. Bruce Drake, both Industry Canada officials. Even where a new tower is being erected and people are advised, and the municipality objects, the final decision rests with Industry Canada and the company. There is nothing your constituents, Ms. McLeod, can do. It is a sad state of affairs when you are told you cannot object on the basis of health -- but that is Industry Canada's policy. Neither can you object on the basis of property value (which on average decreases 30-40% when a tower is nearby) -- that is Industry Canada's policy. 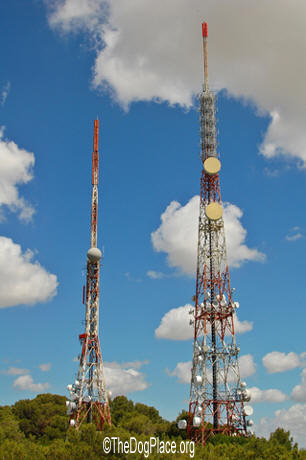 And when one tower is up, as many transmitters can be placed on it as the companies want. And there is nothing you can do to argue it -- that is Industry Canada's policy. In fact, Industry Canada won't even tell you when a new transmitter or new transmitters are added -- that, too, is Industry Canada's policy. Mr. Muc or Mr. Habash said Safety Code 6 doesn't need to be revised because people could use caution when using devices, such as phones. People can choose not to use cell phones or to use them less. But there is no way people can use caution when living near transmitters. We have no choice but to being radiated all day every day -- that's Industry Canada's policy. Don't let electropollution—the newest toxin—zap you and your family. An array of seemingly unrelated symptoms—acid reflux, ADHD, anxiety, asthma, blood sugar surges, blurred vision, changes in blood pressure, chills, chronic fatigue, circulation problems in the extremities, depression, dizziness, fibromyalgia, hearing loss, heart palpitations, insomnia, muscle weakness, shortness of breath, and even seizures—have been linked to exposure 24/7 from all those gadgets that make life easier for us. "Modern society continuously exposes the population to electromagnetic radiation, the effects of which on human health—in particular reproduction—are still unknown," write Italian scientists in a new study. Their findings? Even extremely low frequency electromagnetic fields (EMFs) significantly reduce fertility in animals. That's just the tip of the iceberg—electrically speaking. Environmental exposure to electropollution from faulty wiring, high-frequency broadcast waves, power surges, and those barrel-shaped transformers on power lines contribute to electropollution—as much as air conditioners, cell phones, computers, microwaves, PDAs, TVs, stereos, and wi-fi all contribute to auto-immune problems (including cancer), multiple sclerosis (MS), amyotrophic lateral sclerosis (ALS), and miscarriage. I've been writing about the dangers of EMFs for over a decade, researching this problem to discover the invisible cause of all those unrelated health problems my clients—and I myself—have been mysteriously experiencing. Unfortunately, few healthcare professionals have a clue about electropollution. Europeans are far more concerned about this problem than Americans, and one recent study shows that a third of German physicians associate EMFs with patients' health complaints. Further complicating things, environmental toxins—increasingly prevalent in today's world—increase the risks from electropollution. Combined exposure to endocrine-disrupting atrazine and to EMFs significantly increases the number of mast cells, which are involved in auto-immune problems like allergies, in young animals in recent research. And several studies show that people watching television have an increase in mast cells. Even fluorescent lights (including those new low-energy bulbs) can cause problems for certain individuals. What Makes Electricity The Newest Pollutant? Researchers now tell us that the US electrical grid is polluted by invisible "dirt"— high- and mid-frequency signals—that may be responsible not only for damaged machinery but also a host of physical symptoms (ranging from headaches and joint pain to memory loss and seizures) in people. Our electrical system was designed for light bulbs and motors—not widescreen plasma TVs and computers in every home. Most electronic equipment plus air conditioners and refrigerators—anything with a thermostat—create a power surge every time they turn on. Arcing—itself a power surge from faulty wiring or even a tree limb brushing against electrical wires outside your home—is yet another way electricity can turn "dirty." While you probably have your computer and other delicate electronic devices plugged into a surge protector, there's no such device to keep you or your family safe from dirty electricity! But there are numerous ways you can keep your home from becoming an EMF version of the Amityville horror. · Don't microwave if you can help it. Microwaves levels within the kitchen can be significantly higher than those from nearby cell towers—and EMFs travel through inside walls, affecting anyone on the other side. · Cordless phones emit almost as many EMFs as cell phones and microwaves. Use a corded phone whenever possible. · Electric blankets and waterbed heaters have been linked to miscarriages. If you use one, turn it off before getting into bed. · Whenever possible, replace electrical gadgets—egg beaters and mixers, knives, pencil sharpeners—with hand-powered devices. Because hair dryers emit EMFs, invest in a wall dryer that uses a flexible hose. · To prevent the risk of arcing, replace light switches that are old, poorly made, or worn. Also remove dimmer switches, which emit broad frequency radiation, or at least use them on "high" or "low" instead of the middle range. · Have a certified electrician check for electric code violations, loose connections that may cause arcing, and neutral wiring whose insulation has been pinched. Better yet, consider consultation with a certified EMF safety advisor at www.buildingbiology.net. Recently, a certified EMF remediator surveyed our home—only to find that my body voltage in the master bedroom rated "extreme concern" —no wonder I kept waking up throughout the night, sometimes with heart palpitations! Apparently a power line outside the house was creating stray voltage that entered our home—causing silent and invisible health risks. Since we all need 8 or more hours of sleep, bedrooms are primary areas to check for EMFs. Removing all electronic devices (even clock radios) and unplugging all electrical devices before sleep can make a difference there. Calcitrol, the active form of vitamin D3, combats low-level background radiation in the home. This form of D helps facilitate cellular communication, which is interrupted by EMFs, and also activates a healthy immune response, which can be tamped down by exposure to "dirty electricity." Take 3 capsules (twice daily) of Female Multiple or Male Multiple. I've recently increased the daily dose to 1000 IUs of this form of D in both of these multis—along with EMF-protective antioxidants and minerals. Because electropollution can seriously reduce the body's production of melatonin (the antioxidant-like hormone linked to cancer protection), I recommend taking 3 to 15 mg daily, preferably in a time-released formula. Unlike other antioxidants, melatonin is able to cross the blood-brain barrier—meaning that it can actually breach the membrane designed to prevent toxins from entering your brain—and has been found twice as effective at preventing free radical damage to cell membranes (one of the prime targets of EMFs) as vitamin E.
May 10 at 10:30 am hearing for cell phone warnings in San Francisco at City Hall. I have been carrying the torch a long time and I need your help now more than ever. If we do not get A LOT of people there , this will lose. WE DESERVE TO KNOW!!! Your kids and grandkids deserve to know. This legislation will die without your support- we need babies, teens, young adults, parents, educators, doctors, retailers,- take the morning off – this is critical to the lives of so many. If this continues and 10% of cell phone users develop brain cancer as 10% of smokers developed lung cancer, we will see 500,000 million brain tumors worldwide in the next 10-20 years. I never thought this would happen to us. Have your family members or friends who live if SF come – but if you live nearby come also-it does not matter. I cannot stress the importance of this. SF is first city to have the guts to do this- we need to support that and get this momentum going. CA. has started legislation. Read May Men's Health, Harper's, Newsmax- read yesterday's SF Chronicle. This is for real. BUT without your help people will remain uninformed. I know it is a work day- please do what you can to come and encourage others- especially stay at home parents to come with their kids. I will send a reminder. Please do not rely on others to do this for you. Thank you on behalf of all I know that are already dead or dying from this. Thank you on behalf of our future generations. Can cell phones really cause brain tumors? Each Wednesday during Good Morning San Diego, KUSI provides the latest research, advice, and health information. These days almost everybody has a cell phone. The technology has been around for nearly 30 years, and after numerous studies there's growing evidence that people who use their cell phones frequently and over a long period of time could increase their risk of developing a brain tumor. Dr. Santosh Kesari, Director of Neuro-Oncology at the Moores Cancer Center at UC San Diego, joined us with the latest findings, and to tell us about a clinic here in San Diego that's helping to treat brain tumors. "The BRAG™ Antenna Ranking of Schools"
WASHINGTON--(BUSINESS WIRE)--A new report, "The BRAG™ Antenna Ranking of Schools" ('BRAG™ Ranking'), will be unveiled Wednesday by Professor Magda Havas, PhD of Trent University, Canada, along with Citizens for Health, ElectromagneticHealth.org, EMR Policy Institute and Moms for Safe Wireless. Media Teleconference Wednesday, April 28th - 10:00 a.m. Eastern. The BRAG™ Ranking report recommends schools, school districts, municipalities and states call upon the FCC for a ruling that requires a 1,500 feet setback for any/all wireless infrastructure near schools. NEW YORK, April 15 (Reuters) - Customers of Comcast Corp (CMCSA.O), Time Warner Cable Inc (TWC.N) and Cablevision Systems Corp (CVC.N) will soon be able to use their Wi-Fi-enabled devices in the New York metropolitan area even if they're out of range from their local cable company. The three companies said on Thursday that they had reached an agreement to allow their respective high-speed Internet customers to roam freely across each of their Wi-Fi networks with devices like laptop computers and Apple Inc's (AAPL.O) iPad. The cable companies have been building out free Wi-Fi services for their customers across their respective regions at locations like major train stations and public parks. Customers can access all three Wi-Fi services and sign on to their own provider's network. By offering free Wi-Fi as part of their fixed-line Internet service, the cable companies hope they can beat back competition from paid-for wireless Internet services from phone companies like AT&T Inc (T.N) and Verizon Communications (VZ.N). OTTAWA — A battle is brewing on Parliament Hill over whether mobile phones, wi-fi networks and cell towers emit too many harmful microwaves. Industry officials say they don't and argue the scientific community is behind them, but a fledging Montreal-based group, Save our Children from Microwaves, say they have science on their side, too. Both sides — which vehemently discredit each others' science — are testifying at the Parliamentary Health Committee this week. Former New Brunswick Premier Bernard Lord, who now heads up the Canadian Wireless Telecommunications Association, said the industry is "fully compliant" with Health Canada's regulations, and the science that supports the industry is independent. "We know there is scientific, peer-reviewed studies done around the world and they all come to the same conclusion. The standards that are set ensure the devices are safe," Lord said. "There's no credible study that has come to the conclusion that there is a risk to human health." But Francois Therrien, a spokesman for the wireless wary, has said that sounds suspiciously like the tobacco industry in years past. "The industry says 'we are waiting to have the proof of the link between the microwaves and illness,'" Therrien said Tuesday. "It's too late. We don't need this proof. The reality is people are sick when they are in the presence of microwave (emitting devices)." He said symptoms of electro-hypersensitivity include: fatigue, headaches, memory loss, skin problems, dizziness, and loss of appetite, among others. Industry Minister Tony Clement said the regulations are based on the "latest science," and a spokeswoman for Health Canada said as long as exposure complies with its limits, "the department has no scientific reason to consider exposure to low-level radiofrequency fields, such as those from cell towers, dangerous to the public." The Health Committee will hear from more witnesses on the issue Thursday. Joel M. Moskowitz is director of the Center for Family and Community Health in UC Berkeley's School of Public Health. Diana McDonnell and Gene Kazinets collaborated on this commentary and the research review. To see five ways to use your cell phone safely, go to http://sfg.ly/c0Fy9y. New technology revealed in a U.S. Senate Committee this week would allow Big Brother to monitor your compliance with Big Pharma's drugs and even remotely administer drugs into your bloodstream from a government-run control panel in Washington D.C. Note - this is a private site not usually up to date with all masts. Waves from mobile phone towers evidently have the effect of constantly switching the body's natural electrical field. Building biologists are judging the only truly safe area in homes to be the basement. Well, homes in Bahrain have no basement. I wonder if Bahrain has building biologists who visit homes and test them for waves! I also wonder what the findings would be! These towers expose the public to involuntary, chronic, cumulative radio frequency radiation. Reported health problems include headache, sleep disorders, memory impairment, nosebleed, increased heart rate, lower sperm count, impaired nervous system and increase in seizures. The list is endless. I am almost certain that within three to five years there probably will be clusters of serious illnesses in Bahrain, be it Tubli or somewhere else. This is one example of a headlong rush into technology before finding out whether it is safe. Authorities across the world had maintained that asbestos, cigarettes, thalidomide and the blood supply were "safe", but which were later found to be harmful. In the US, with a $40 billion-a-year industry at stake, you can bet that their studies are going to show whatever they want them to show. I would like to ask the Telecommunications Regulatory Authority, Health Ministry and other concerned authorities: what is the current standard for such radiation in Bahrain? We, the people, are entitled to know. It does not matter from which source the information comes from. Another question is: what the department of licensing and inspections takes into account while granting these permits? Also, have environmental impact studies been carried out in Bahrain? With regard to Elaine who wrote about her concerns regarding masts in her area (Mahooz), I understand her worries and discontent as she lives near such a tower. I hope that she has reported the symptoms she is experiencing to a hospital. We should not be forced to act like guinea pigs for the next 20 years. In short, we are the experiment for health effects. If it ever happens, and I hope it will not, - the mobile phone tower in front of my house on Road 1122 is activated - then my days hanging out in the garden in the evenings with a cup of tea will be over for good for the simple reason that I don't want to be cooked in the same manner that a microwave oven works. Of course, the owner of that building lives elsewhere. By the way, there are more such towers in Tubli than I initially reported. I have seen another somewhere behind the Tubli treatment plant, and on my trip to Old Tubli, I saw more than the four I reported. 18) this list of recommendations be not considered exhaustive in general description of action required by the Government of Canada to perform the utmost service of protection of its citizens from the potential harms of exposure to electromagnetic radiation. To add your name to this list - contact Daryl Vernon at this address ck872@sympatico.ca or by phone 416 631 1495, providing at least first name (or initial if preferred), last name, province, preferably with municipality. "War on health effects of wireless devices waged in capital"
"A battle is brewing on Parliament Hill over whether mobile phones, wi-fi networks and cell towers emit too many harmful microwaves." "The Health Committee will hear from more witnesses on the issue Thursday." Don't be put off if you hear classical music -- that stops after a short time and the session begins. Check out this video RETA put together about high voltage power lines http://www.youtube.com/watch?v=E2JoYdo1kk8. Also, if you could pass it on to everyone you know and ask them to pass it on to everyone they know etc., I'd much appreciate it. This issue needs awareness, not just here in Alberta but everywhere. REDLANDS - The Planning Commission could decide today if San Timoteo Canyon could be home to a new cell phone tower. Royal Street Communications - a division of Metro PCS - wants to build a wireless communications facility at 28442 San Timoteo Canyon road. The company would build the facility - and tower disguised as a Eucalyptus tree - on 17.14 acres on the southwest corner of San Timoteo Canyon Road and Lisa Marie Lane. "These things are kind of a necessary evil," said Planning Commissioner Carol Dyer. "In order to provide the coverage that people want, they have to put these things up." Two homes, a horseback riding academy, a horse boarding facility and three 164-foot-tall radio transmission towers occupy the property now. The radio towers have been in place since 1990 and they service an FM radio station in Moreno Valley. Royal Street Communications wants to build the 75-foot-tall cellular tower - 80 feet including the Eucalyptus tree disguise -that would include a six-panel antenna array, a GPS antenna and a parabolic microwave antenna. Dyer said the tower should not raise any major concerns during Tuesday's Planning Commission meeting, as it is well away from other structures and neighbors. "The efforts to blend (the towers) in has increased over time," she said. The Planning Commission is scheduled to meet at 2 p.m. today in the Council Chambers at City Hall, 35 Cajon St.
Cellphone towers, cordless telephones and the wireless networks that link home computers send out microwaves that pose myriad human health risks, say witnesses who will tell federal politicians Tuesday that existing exposure limits are too high. Magda Havas, a professor of environmental and resource studies at Trent University in Peterborough, Ont., works with people she says are "electrically sensitive." "When they are exposed to this microwave energy from an ordinary cordless phone, their heart goes crazy," said Dr. Havas, who will appear at a meeting of the Commons health committee. "They simply cannot survive in our normal urban environment any more. They either seclude themselves in their homes [where] they have special paint that they put on their walls and fabric for their windows to keep the radiation out," or they move to rural areas. Microwaves have also been linked to cancer, an inability to control diabetes, sleeping disorders and a range of neurological ailments. Dr. Havas and others who fear the effects of electromagnetic energy want the allowable exposure levels reduced, and they want the government to publicize the dangers they perceive in the communication devices that exist in most Canadian homes. But for every study that says the waves are dangerous, there is another that says they are perfectly safe. Health Canada, which sets the guidelines for microwave exposure, says that as long as the recommended limits are respected, the department has no scientific reason to consider exposure to low-level radiofrequency fields, such as those from cell towers, dangerous to the public. Bernard Lord, the former New Brunswick premier who is now the president of the Canadian Wireless Telecommunications Association, will also appear before the Commons Health committee on Tuesday. "The wireless industry fully complies with the regulations that are in place," Mr. Lord said. "Not only do they fully comply, the members also believe that they are safe. We are all users of this technology. Not only do we use it on a day-to-day basis with our own wireless devices in our hands, but many of us have WiFi networks at home. And you have Internet cafés with WiFi waves. It's all around you. It's everywhere." François Therrien, a spokesman for Save Our Children From Microwaves who will also appear before the committee, said the members of his group understand that cellphones are here to stay. "But we want to make them safer," Mr. Therrien said. "We want warnings on cellphones and we want the cellphone companies to stop selling these products to children." I am writing about the meeting scheduled for HESA on April 27 and 29 to begin discussions about Health Canada's need to re-visit Safety Code 6, which is the guideline used to protect the public from microwave and radio frequency (MW/RF) emitting electromagnetic radiation (EMR) from FM and cell phone transmitters, DECT phones, WiMax, WiFi, etc. Within the MW/RF EMR also included and specially is meant the modulation as well. Having suffered from life-threatening symptoms which later turned out to be electromagnetic hypersensitivity (EHS), and only with the help from a well qualified German medical doctor (who is also an expert in EMR and its thermal and non-thermal biological adverse effects) and with my research, I have been able to greatly reduce my EHS mainly by avoidance of EMR as much as possible, not only in the Radio/Microwave frequency range (RF/MW), but also in the Extremely Low Frequency range (ELF) emanating from 60 Hz electric power system and appliances. In 1996 I joined the Coalition to Reduce Electropollution (CORE). With CORE's initial assistance I have further studied the electromagnetic pollution and its effects, as well the attempts of industry with no regard to environmental harm to sell harmful EMR emitting products to the uninformed. This especially applies to the cell phone industry which places its microwave transmitters in the midst of populated areas – homes, workplaces, hospitals, parks, and especially schools. I have become well-versed on the issue and keep informed on new developments by reading, in both German and English on a daily basis, all available research by authorities. Now heading CORE, I voluntarily assist in informing the public of misleading scientific information in the media, much of which could lead to more exposure to the dangers inherent in EMR. Much of this information is disguised as scientifically proven when in fact it is nothing more than an advertisement paid for by the companies to make people believe their products are safe. Recently I have begun to question whether Health Canada and Industry Canada are acting in the best interests of Canadians. Health Canada refuses to adopt/apply a precautionary principle-based approach which would require caution in the use and placement of wireless equipment until it has been proven safe. Instead, Health Canada allows business to introduce new wireless "gadgets" without testing, forcing an unsuspecting public to prove beyond a shadow of a doubt that they are unsafe. Having read a number of books on the subject and being especially influenced by Thom Hartmann's book "Unequal Protection, The Rise of the Corporate Dominance and the Theft of Human Rights", UVIC law professor Joel Bakan's book "The Corporation, the Pathological Pursuit of Profit and Power", and many other books, especially former Health Canada senior employee and whistle-blower Shiv Chopra's "Corrupt to the CORE", I am now convinced, that the Canadian Government is not truly acting in the best interest of the general public, but the interest of $$$-driven corporations! Health Canada and Industry Canada have managed to dig themselves into a hole: Industry Canada has been selling frequencies to the telecommunication industry for millions of dollars. Now, if Industry Canada orders the telecommunication industry to restrict the use of RF/MW, it will face major law suits for compensation. And Health Canada has no influence with the telecommunications industry because Industry Canada is its regulatory agency. So they've dug themselves into a hole! It is time that the Government stands up to the unprincipled telecommunication industry and heeds the recommendation of independent researchers. It should follow the lead of other countries. For example, based on the BioInitiative Report the European Parliament and its member countries unanimously adopted a resolution in 2009 to address public health risks from EMR, including those from wireless technologies. - electromagnetic pollution's (ELF-, RF/MW- EMR) trespass, intrusion/invasion onto and into private property and human bodies. EMRs are tangible intrusions that can be measured. The energy from EMR has proven harmful biological effects on living tissues and cells. Living tissues and cells (as in human bodies) are very good conductors, therefore, when exposed to EMR (ELF, RF/MW) human bodies become an antenna and the body voltage is increased. Our Constitution states that private property shall not be taken or damaged for public or private use without just compensation. Without informed consent, the property owner's rights to live in peace and enjoy his/her home are violated whether or not EMR exposures are permitted out of ignorance, inflicted arbitrarily, wantonly and willfully and without due process of law. As I stated above, EMR exposures refer to those products and facilities with emission thresholds which have not yet been established by independent/un-biased scientific studies to be safe. So far, to my knowledge, no governmental agency is measuring and checking transmitter stations' output as per set guideline, but the industry does it on behalf of the government. I find this outrageous and equal to the fox guarding the hen house. It has come to my attention, that plans have been discussed –if not yet developed- to harvest microwaves for charging batteries of any kind. Innocent and ignorant consumers will love this new kind of invention incorporated into their cell phones, thus resulting in millions of current cell phones being dumped and replaced by newly micro wave-harvesting cell phones, eliminating the need for a wired charger. Consequence: another reason for the industry to $$$-lobby governments for not allowing the MW/RF radiation exposure threshold to be reduced. For thousands of years, humans were able to live without wireless gadgets and their necessary transmitter stations; my grandparents, and parents did so, I myself am and will be still living without them for health reasons. I refrain from further elaboration in my submission, as I am aware of some other submissions that have already been sent to this Committee, which I fully endorse. Canada's safety standards are not adequate to protect the general public. For Health Canada to base its Safety Code 6 also or mainly on industry-driven WHO and ICNIRP research and their guidelines is not right. Implementing and allowing industries' direct or indirect funding of research should be disallowed and these kinds of research should not be accepted. On the side: the Journal of the American Medical Association (JAMA) have recently recommended an imperative fundamental reform - what refers to the medical discipline- a complete ban on industry-funded pharmaceutical and medical research that includes the education of doctors which "must be carefully distinguished from marketing". JAMA also recommended that medical organizations should no longer accept money from pharmaceutical companies at all. To summarize, the public trust is already slowly and steadily crumbling. In 1995 I bought a home in Harrison Hot Springs BC ,a lake side holiday resort Village aprox 90 KM east of Vancouver. Soon after moving into that home both my wife ,at the time,and I started hearing a strange buzzing sound . I would wake up at 3:20 every morning to the buzz and it would get louder over the next hour and I would feel pressure build up in my head.At time it was so hash that I had to get out of bed and hold my hands on my ears to try an stop the pain. After about a month I traced the cause to a CBC TV broadcast tower which was 375 feet from my back door. We were taking all kinds of medication to try and get a nights sleep and nothing seemed to help. I was prescribed 4 different drugs,,saw 3 different specialists,given 2 hearing exams and non could establish the cause of my illness.My hearing became affected to the point I could not use my telephone. I sent letters to Health Canada and always received the same answer stating that my illness could not be caused by the tower. I have the letters in my files. Things got so bad that we started renting motel rooms in order to sleep and after living in that home for a year I became hyper sensitive to electro magnetic fields and we had to move .
. For more information please contact . Robert Riedlinger 30199 Silverhill Ave Mission BC. This is regarding 'new masts' going to be installed all over Bahrain, mainly in residential areas! It seems to me that the Health Ministry just does not care about the people, which is amazing. If it did care, it wouldn't be allowing the installation of around 400 mobile phone masts I've heard will happen throughout this year! Why can't telecoms companies share the masts? Is it true this will never happen because a certain company refuses, resulting in others having to erect their masts! In Dubai they have very few masts and there are never reception problems! When will Bahrain authorities wake up and smell the coffee and follow Dubai's example? They are a health hazard and the sooner the Bahrain government realises this the better! The so-called temporary mast in Mahooz is still there, five months on, and there's no sign of it ever being moved. Whenever you ask when this mast will be moved, the reply always is: ''it's only temporary and will be moved soon''! Now we have another new company invading Bahrain, with a whole lot more masts being erected for it to operate in Bahrain. I wonder if there's been a rise in respiratory diseases, cancers, tumours, skin ailments in Bahrain over the last few years. Would the ministry divulge this information if it were found to be true, possibly not as it is obviously in denial as to how dangerous these masts are to human health. Mobile phone masts are the new neighbours from hell. The meetings are scheduled for 9-11 am. East. time. If you cannot listen live or wish to re-listen to them, you can go into this site and visit the archive by going into the calendar. You can select time and date of the meeting you wish to hear. After the meetings, the minutes will also be available to the publc. Bone, joint, coordination, reproductive or behavioral problems that defy diagnosis? Constant exposure to electromagnetic frequencies (EMF) can destroy human and canine health; how to identify magnetic fields. Barbara Andrews / © TheDogPlace April 2010 - While magnetic crate pads are great for arthritic pets, magnetic fields are not. Powerful magnetic fields are often associated with ley lines (ref #1) linking ancient sites. The mysteriously lines are also thought to be magnetic navigation guides for many ocean, land, and migratory bird species. Consistent exposure to magnetic fields and the electromagnetic radiation (ref #2) they generate can cause missed breedings, infertility, bone and joint pain, behavioral and reproductive problems, nausea, dizziness, and crippling or deadly health problems. Constant exposure to electromagnetic frequencies (EMF) (ref #3) emitted by cell phone, satellite towers and power lines also cause serious medical problems. High voltage power lines emit "stray voltage" proven to interfere with milk production and cause crippling deformities and death. In the mid-eighties, Wisconsin dairy farmers were awarded multi-million dollar settlements after new power grids sickened and killed herds. In 2004, the court denied Idaho Power Co. appeal of a $17 million judgment in a stray-voltage case also involving dairy cows. The point here is that these were large commercial operations with top notch veterinarians and legal resources. Who is looking out for your show dogs and precious gene pool of breeding stock? Electromagnetic science and the adverse effects of electromagnetic radiation have been well documented but veterinarians and even most medical doctors, remain unfamiliar with the effects of prolonged exposure. Electromagnetic radiation symptoms: Few small animal vets would associate the following with chronic electromagnetic exposure: reproductive problems, lack of coordination, dizziness, nausea, swelling or dryness of mucus membranes, and loss of memory and concentration as evidenced by training problems or what is often diagnosed (in humans too!) as early onset senility. Your dog can't tell you about tooth and jaw pain but when he rejects dry dog food, think symptoms instead of spoiled dog. When he hesitates over the jumps or doesn't move out in the show ring or the field, he may be experiencing muscle and joint pain, not apathy. Radiographs may not reveal connective tissue deterioration until too late. Cardiac palpitations can be picked up during a veterinary exam but are unlikely to be associated with electromagnetic hypersensitivity, often referred to as electro-hypersensitivity or EHS. There are many environmental elements your dog can sense but which are beyond human ken. In addition to magnetic pulses, underground water veins cause mild but constant cellular vibration, similar to how a microwave (ref #4) cooks food! If your puppy won't use the bed you lovingly provided, move the bed! If a dog isn't doing well in a new run, move him to the other end of kennel. Some dogs are more sensitive than others. The strongest underground pathways are geopathic energy fields (ref #5). They are the result of natural radiation distorted by electromagnetic fields created by subterranean running water, usually along fault lines or through underground cavities. Geopathic energy fields can be magnified by certain minerals in the earth and such distorted energies are very detrimental to human health. Many researchers believe they can be even more harmful to canines and other sensitive animals due to confinement in smaller areas and thus, long-time exposure to geopathic energy. It has been speculated that rage syndrome in dogs may be more than genetic. Some researchers have also linked magnetic energy fields to otherwise inexplicable elephant attacks. Elephants "hear" with their ultra sensitive feet and are capable of picking up low frequency sound emanating from miles away. What would confinement to a highly charged electromagnetic field do to such a sensitive beast? Even though humans move about more in their daily routine, you should know that geopathic energies pass through walls, windows, floors and closed doors and can change according to the season or time of day. Though invisible, like radio and cell phone waves, such energies have a powerful effect on all living things. One has to wonder about the ancient art of feng shui which developed long before there was a compass to point to the magnetic North Pole. Science now knows that sleeping, living and working in highly charged magnetic or geopathic areas can lead to emotional as well as physical health problems. As with magnetic fields, a primary geopathic symptom is difficulty sleeping which leads to irritability and loss of focus. The same is true for your dog but how would you or your vet know he isn't sleeping? Another well documented symptom in human patients is a high ratio of infertility and miscarriages. If your breeding program has taken a downturn due to missed matings or aborted litters, and take it to a good canine reproduction vet! Then call a dowser to check your property. Electromagnetic fields and geopathic zones may be identified with divining rods, a pendulum, or even kinesiology because highly sensitive people can "sense" these energies. This is not news! In the early 1970s Jacob Stangler created an instrument to detect subterranean gamma radiation and measure the ionization of particles from underground water courses. More recently, NASA scientist Dr. Armin Bickel developed a supersensitive scintillation counter with a built-in computer to pinpoint water veins, oil, and certain minerals over a mile underground. If you or your dog are experiencing any of the enumerated symptoms which on the surface seem unrelated, think outside of the box.